A custom wine label for your homemade wine is the perfect way to show off your bottles. And what could be more custom than your own photo on the label? That’s why we offer personalized photo wine labels. We have an easy way to create personalized photo wine labels. You don’t need to know anything about graphic design or how to use a complex computer program to create a custom label with your own photo. We’ve done all the work for you! All you have to do is go to our Label Gallery and select Upload Your Photo from the Label Category menu on the left side of the screen. This will show you all the custom label templates that are designed to frame the photo you upload. Once you’re there, it’s easy to create a personalized photo wine label with your own picture. Just choose a template, and change the text and upload your photo. Follow the instructions on the screen, which will walk you through, step by step. You’ll see a proof on the screen, so you’ll know exactly what it’s going to look like.Then place your order! We’ll print your labels and ship them to you in just a few days. Check out the photo below. One label design, three different looks! The bottle on the left is Summertime Wines with an image of sunflowers. The other two are the same label, customized with engagement or wedding photos. Personalized photo wine labels allow you to have a completely custom, one-of-a-kind wine or beer label for your homemade beverages. They are perfect for many occasions. 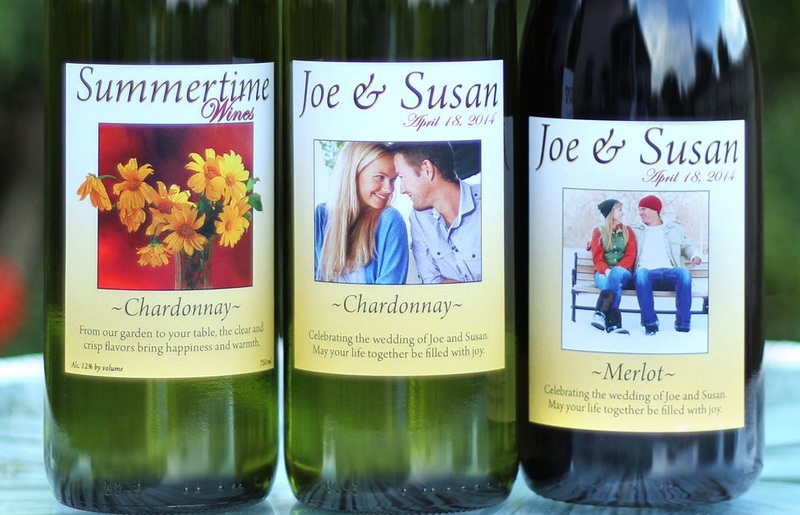 Use photo labels to create personalized wedding wine labels for custom wedding favors at your reception or engagement party. Custom photo labels allow you to have custom wine bottles for anniversaries and for special gifts. You can also use personalized photo labels for a company branding opportunity. Upload your company logo to create a custom company wine label to give to your clients as gifts. You can use any type of photo you want, from a family portrait, your beloved dog, or a snapshot of your favorite view. The opportunities for personalized photo wine labels are endless! Click here to order your own personalized photo wine labels today! Join our email list and never miss a sale, update, or promotion! Click here to join today. This entry was posted in Custom Labels, Gifts and tagged Gifts, Parties, Photo, Receptions, Wedding by Noontime. Bookmark the permalink.